Italy is one of my favourite countries to visit. I love the culture, the people and of course their passion for food- growing it, making it, talking about it and eating it! 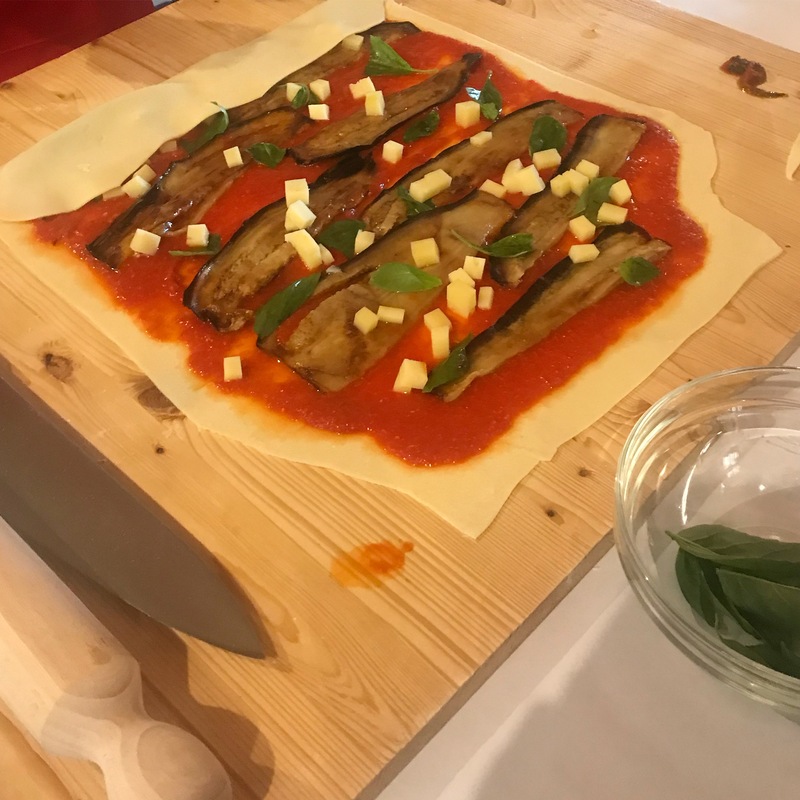 On my travel bucket list was Sicily and an Italian cooking course which I did recently. 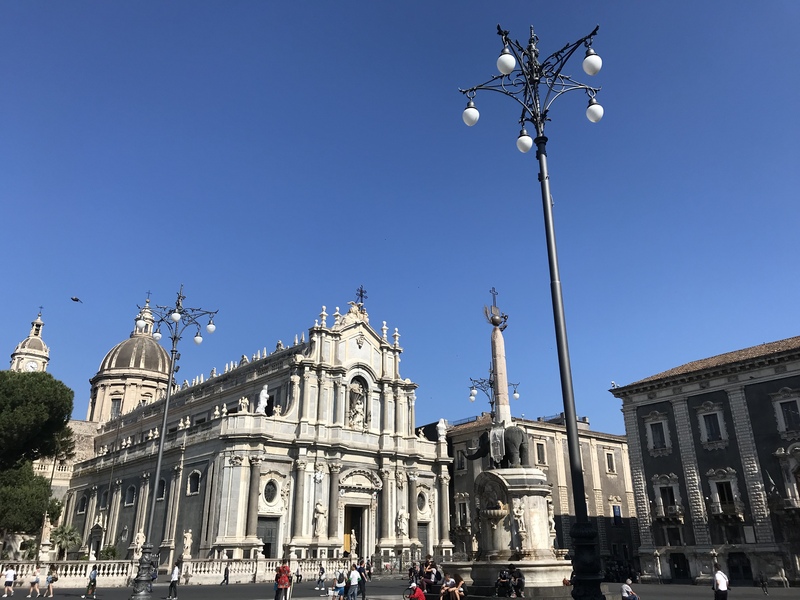 I visited Catania and Southern Sicily staying in a beautiful villa on an agriturismo farm in Rosolini with Flavours Holidays. 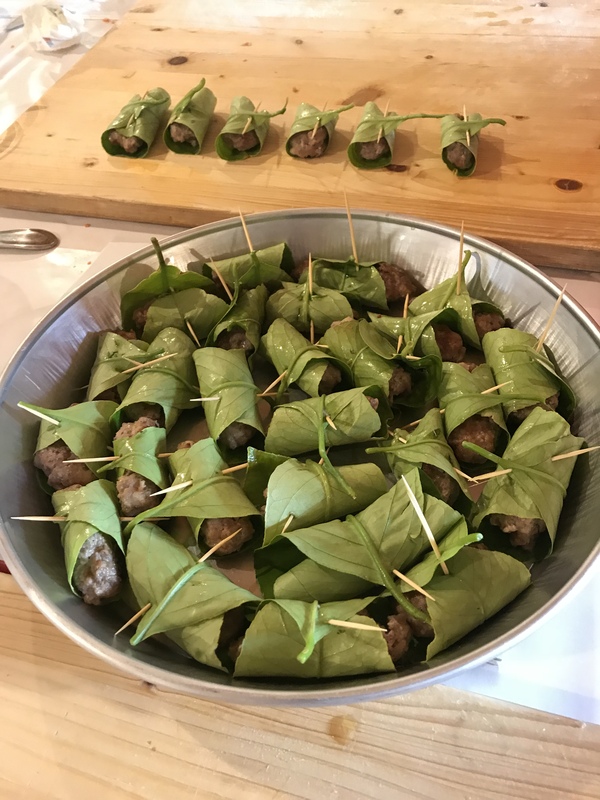 Sicily has so much history that has influenced the cuisine. My key learning was ‘less is more’ with the simplicity of the recipes, using only a few ingredients and the amazing local produce. The understanding of how to combine them to ‘make them sing’ . Using olive oil with one or two herbs at most , perhaps a touch of garlic, delivering an incredible tasting dish- a symphony on the tongue! 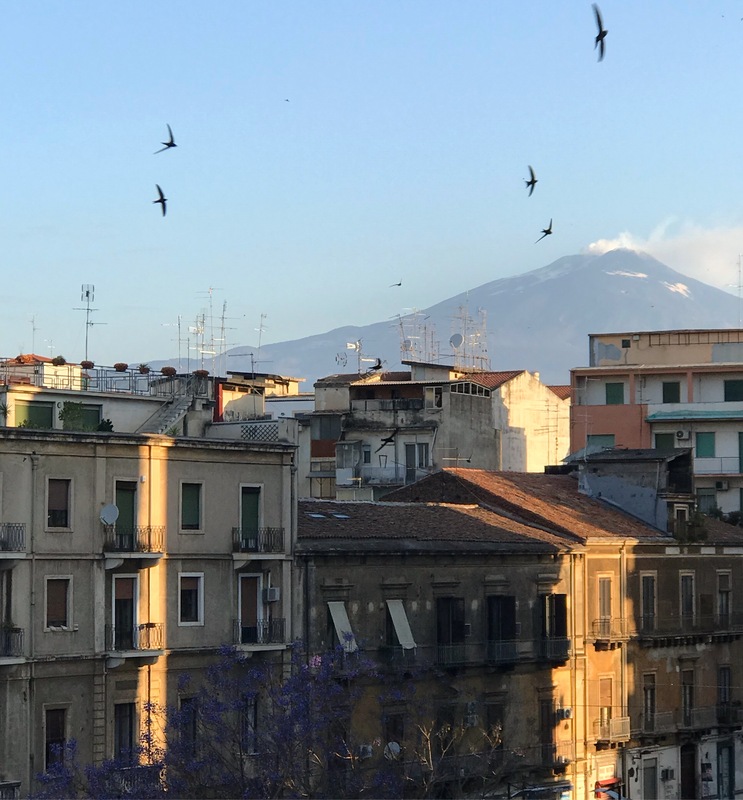 In Catania, Mount Etna, Europe’s largest active volcano dominates the area and its black soil is fertile producing some fantastic food & wine such as lemons, olives, olive oil , honey, chestnuts, pistachios, almonds, Etna Rosso wines but more of that later. 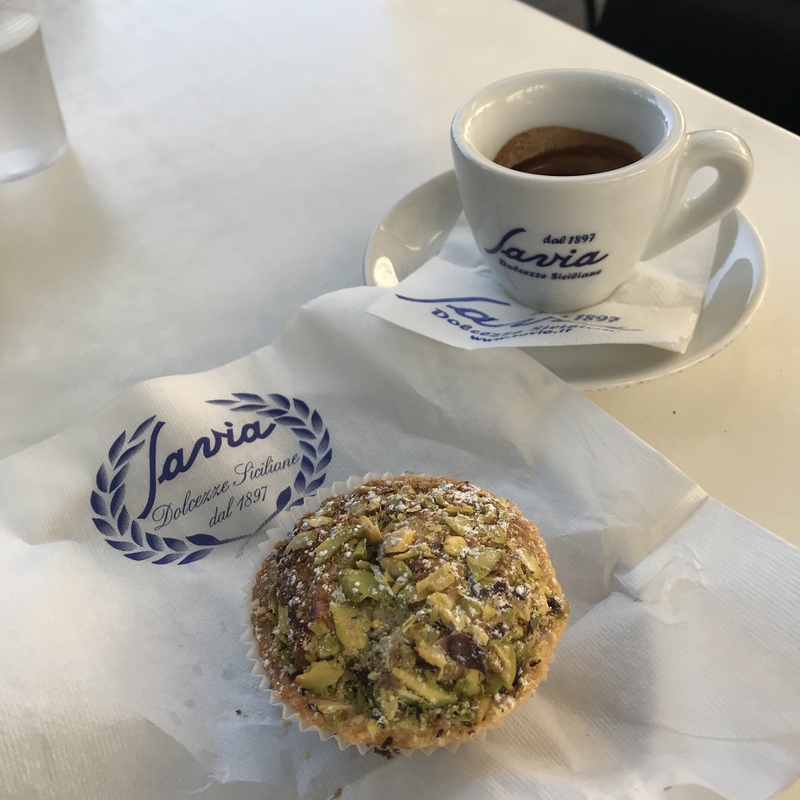 A trip to Savia, the oldest Pasticceria in Catania was a must. Friday afternoon was busy with locals enjoying an espresso and a pastry. 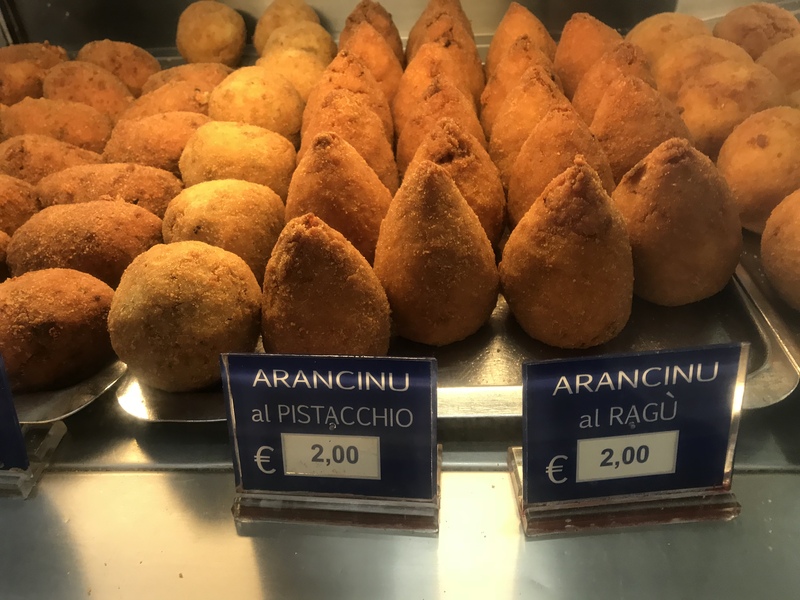 I tried two Sicilian specialities – Arancini al Ragù & Cannoli. Arancini are risotto rice balls filled with a rich tomato, vegetable, meat & cheese filling, dipped in breadcrumbs and fried until golden. The Sicilian arancini are ‘cone shaped’, with the shape supposedly making it easier to eat, by hand as the locals informed me. A bit of a challenge, I did eventually resort to using a fork, very tasty and filling with the layers of flavour. 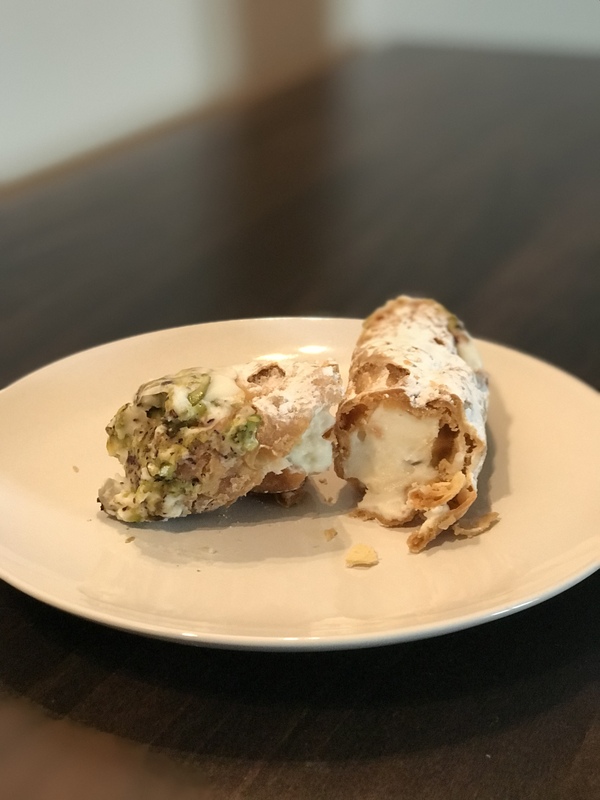 The cannoli were fabulous- thin, crisp outer shell with a lightly whipped ricotta filling with tiny cubes of candied lemon and crushed pistachios at each end. Much lighter & less sweet than those I’ve tried before and absolutely delicious. Meandering around the cobbled streets in search of pizza, I found myself outside Pizzeria Locanda Cerami, a restaurant with a buzzy atmosphere and full of locals, always a good sign. 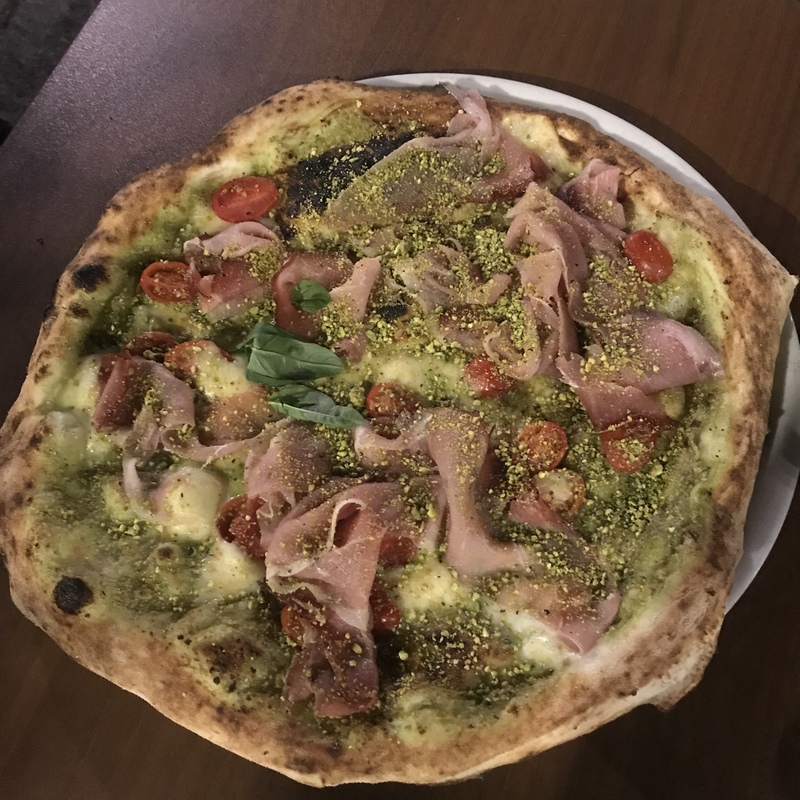 They had a fantastic selection but what caught my eye was one using pistachio pesto instead of the usual tomato sauce- something I’ve never had on a pizza but can highly recommend. It was delicious with some local cherry tomatoes, speck, mozzarella and crushed pistachios on top. A perfect Friday night Sicilian supper with a glass of Etna Rosso taking in the atmosphere. I found out afterwards from Claudia, our Cooking School host , that I had eaten in one of the best pizza places in Catania. 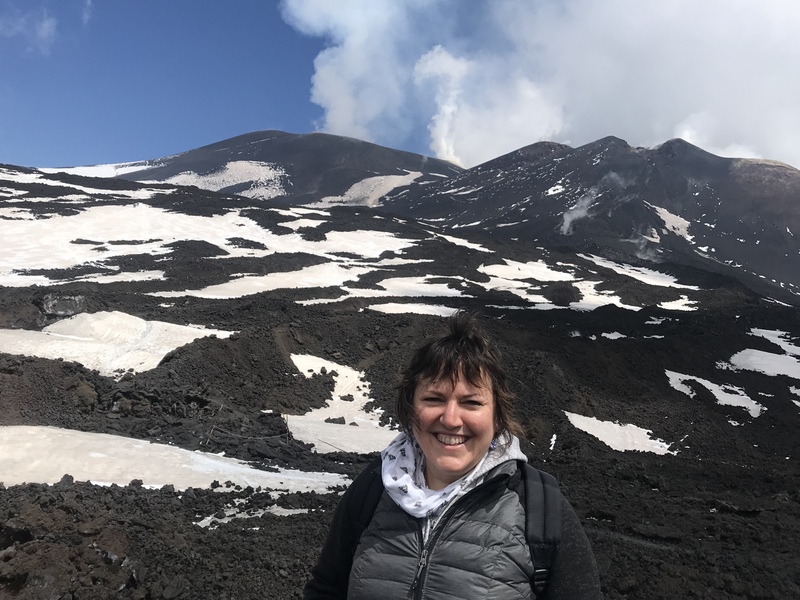 I did a walking tour of Etna, visiting a cave and then via a cable car & all terrain vehicle up to 2500 metres . Walking around with the contrast of black volcanic rock & soil, white snow, and steam rising from the enormous craters. An incredible and unforgettable experience- other worldly and magical. We visited a farm to taste some of the local olive oil, pesto, honey , fruit curds, and wines produced on Etna. After enjoying the pizza I bought some pistachio pesto and chestnut honey. 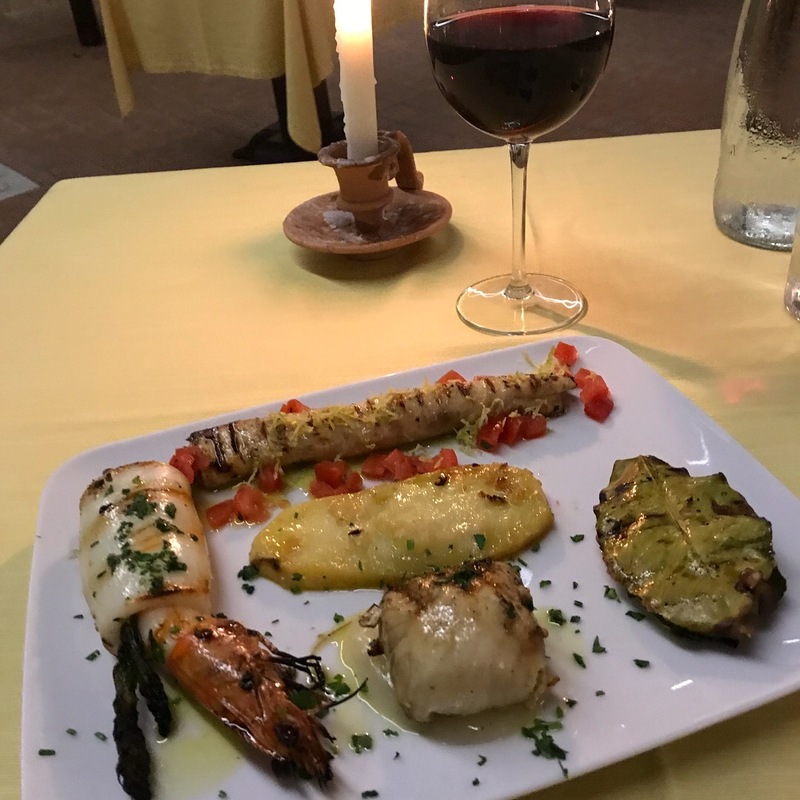 Following a day trekking on Etna I was ready for dinner and stumbled upon one of the best restaurants in Catania – Giardino Di Bacco. I chose their fish tasting plate so I could sample a number of local dishes . I tasted swordfish rolls and long rolls, squid stuffed with prawns and asparagus and tuna wrapped in lemon leaves and grilled. I also enjoyed a glass of Frappato Sicilian red wine. This was one of the best meals I have eaten and definitely a restaurant I would go back to and recommend. 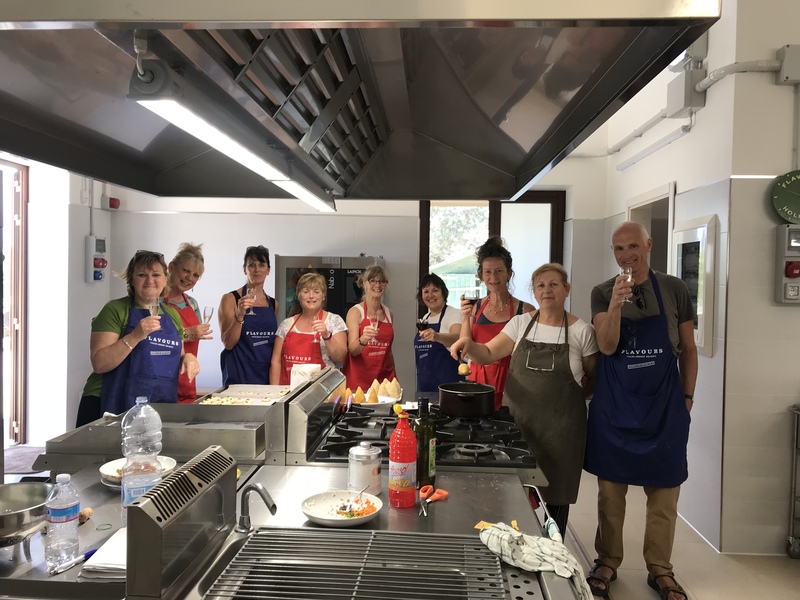 After my short visit to Catania I met up with my fellow Flavours Cooking Crew- 8 enthusiastic foodies for a week cooking and touring around Southern Sicily. 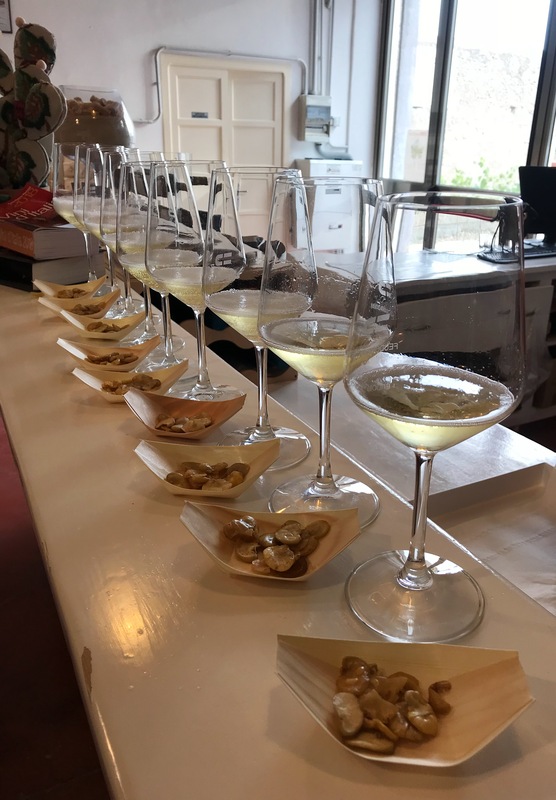 Our base was a beautiful 19th century villa on Schembari farm near Rosolini surrounded by fields of olive, lemon, almond and carob trees- so picturesque. 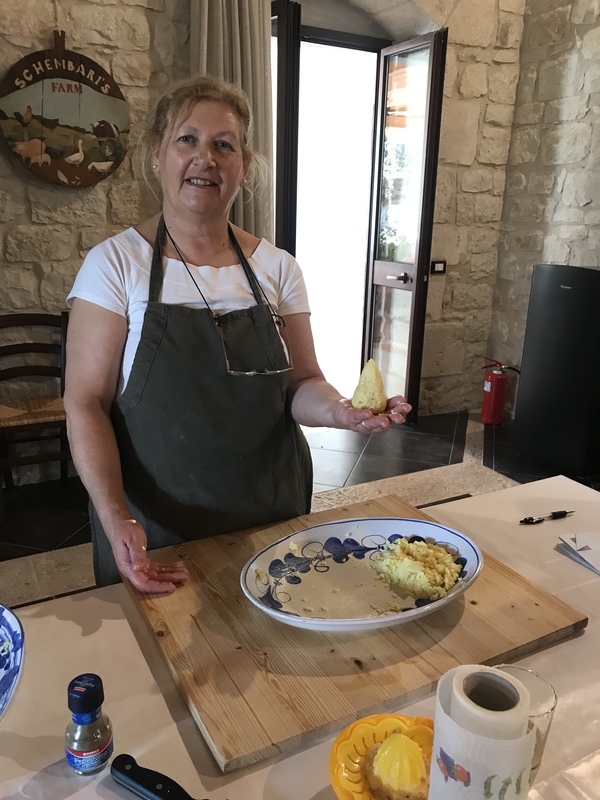 Carmela our chef was a great teacher, and she guided us through lots of Sicilian specialities with a smile and nod of encouragement and approval – she only spoke Italian- so Claudia our fab host translated. The savoury recipes we cooked were: arancini, ravioli filled with ricotta, tomato sauce, cavatelli pasta, meatballs with Sicilian lemon, caponata with aubergines, Falsomagro, or ‘ False Thin’ , a rolled beef or veal joint layered with salami, ham, sausagemeat and boiled eggs, then cooked in a tomato sauce-served in slices . Definitely a dish for festivals and celebrations. 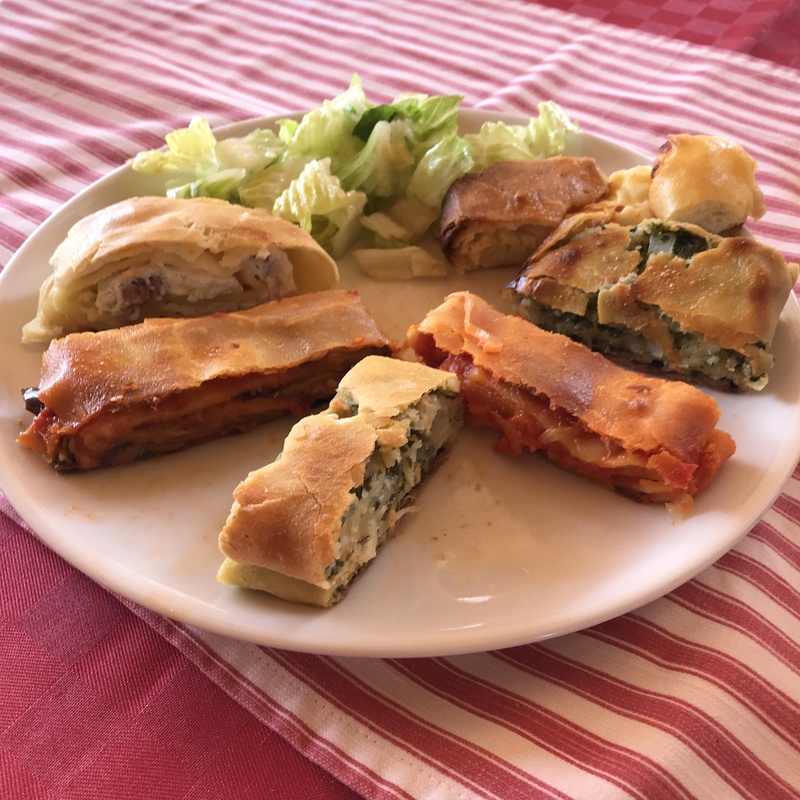 One of my favourites was Scacce Modicane – a savoury thin pastry filled with various fillings including ricotta & sausage; tomato, aubergine, basil; potato, parsley & onion with some local casiacavallo cheese then rolled up like a Swiss roll & baked. It was then sliced – delicious eaten just warm and also the next day cold – perfect picnic food. The sweet recipes were cannoli, the trickiest recipe we made but great fun. Also biancomangiare, a cold blancmange made with homemade almond milk, sugar flavoured with lemon rind & topped with crushed pistachios. 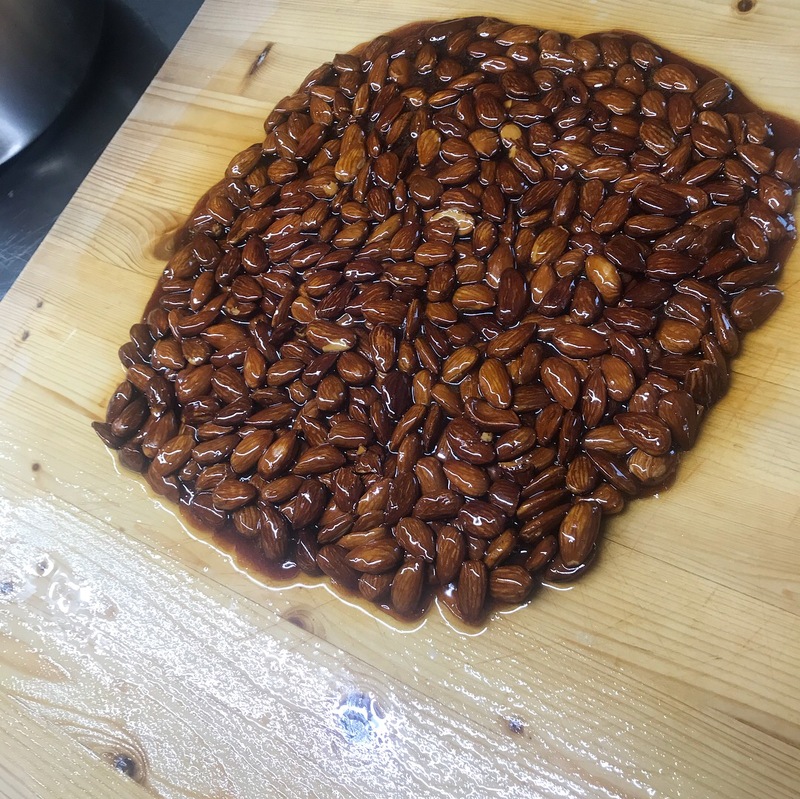 We made almond biscuits and torrone- caramelised almond brittle. 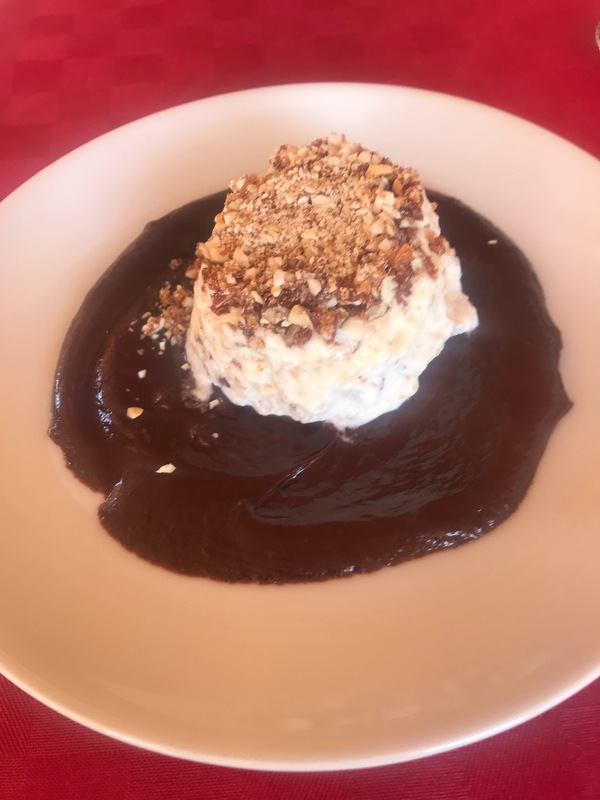 This was used to top my favourite dessert a semi freddo – semi frozen ice cream- served with a dark chocolate sauce using the famous chocolate from Antica Dolceria Bonajuto, the oldest Sicilian chocolate maker in Modica. Rich, indulgent and totally yummy. Definitely Delizioso! We would have classes in the morning and eat what we cooked for lunch. 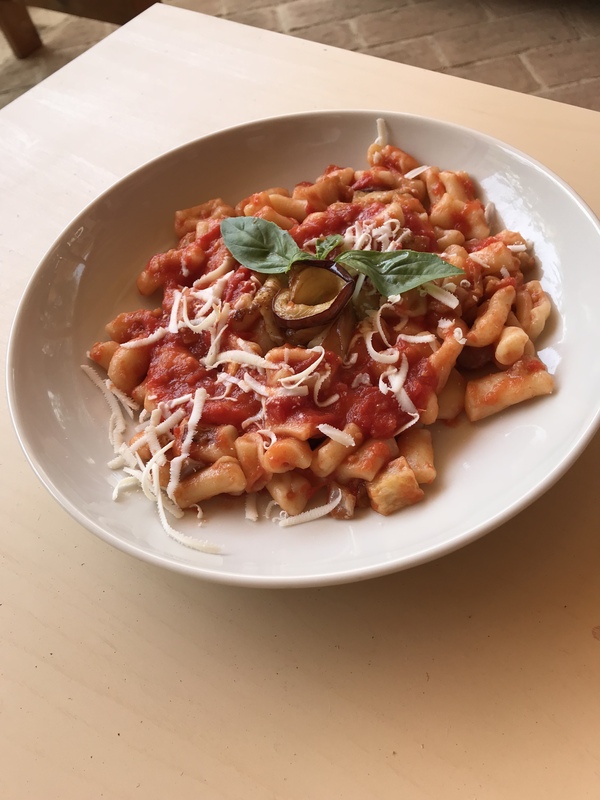 The classes were lots of fun- with banter & bonding over who could roll the thinnest pasta! 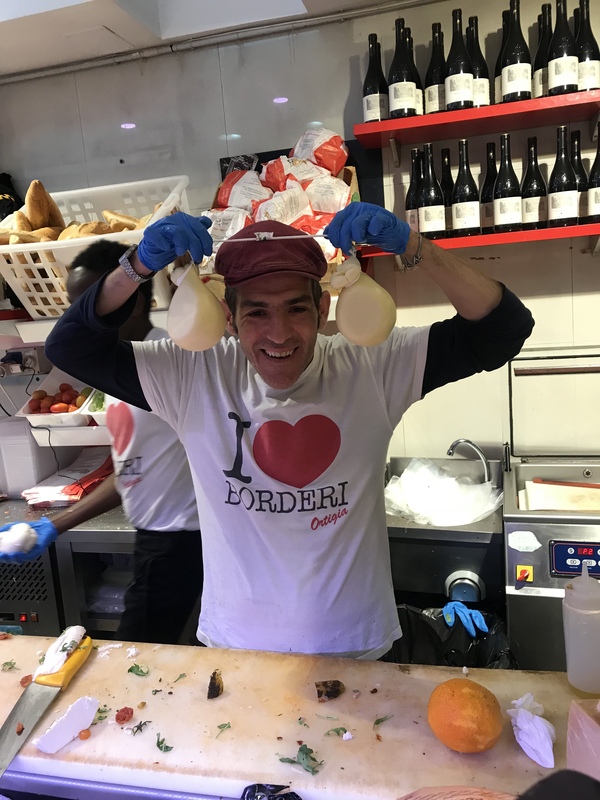 We also visited Modica, with its history of chocolate making; Syracuse and Ortigia Island , a fab foodie market with lots of tomato paste, nuts & cheese purchased- especially after meeting Antonio the cheese maker from Borderi Gli Artisti. 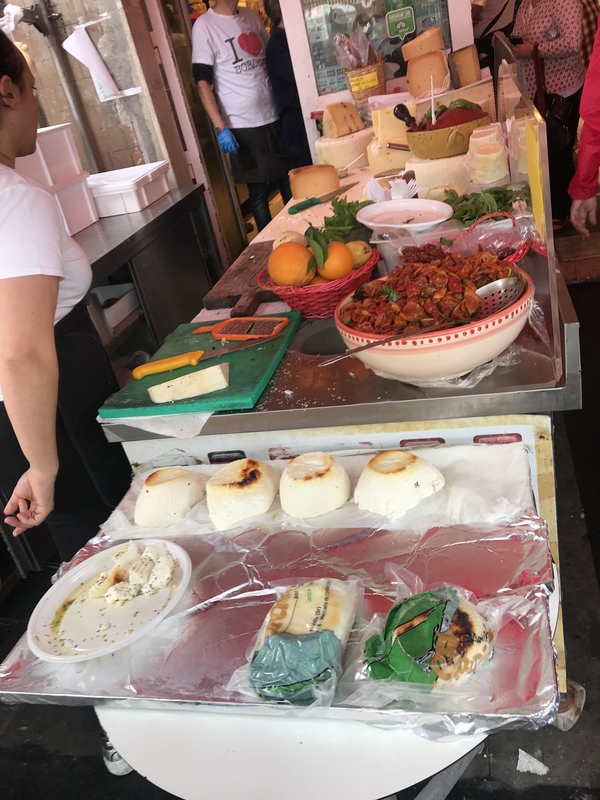 He had Italian charisma, flirting and plying us with samples of his triple baked ricotta and pecorino with peppercorns. A great character and very effective salesman as we all ended up buying lots of cheese. 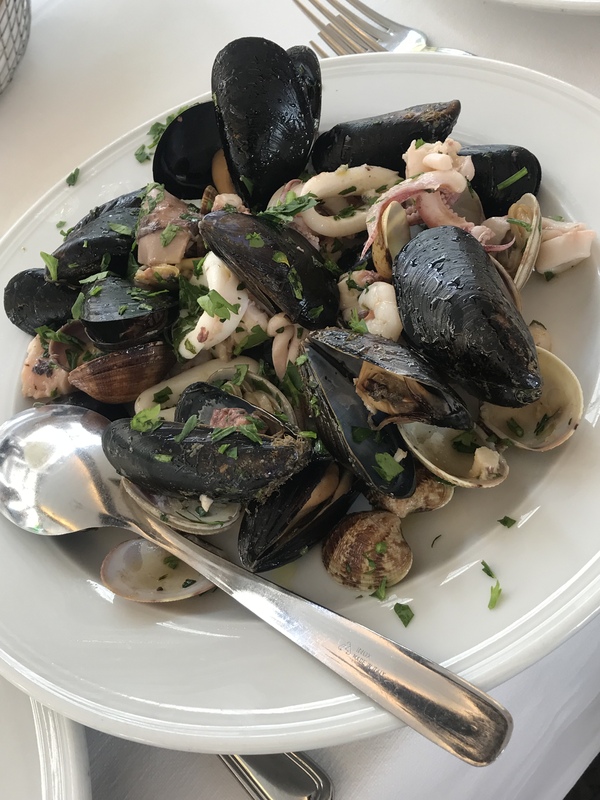 We enjoyed lunch at a fish restaurant, sampling the mussels, clams, calamari and prawns, Frito Misto Di Mare and pasta alla Norma – with aubergines and rich tomato sauce. We went to Marzamemi, an old fishing village , with some wonderful wine tasting & canapés at Feudoromaddini a local vineyard nearby. 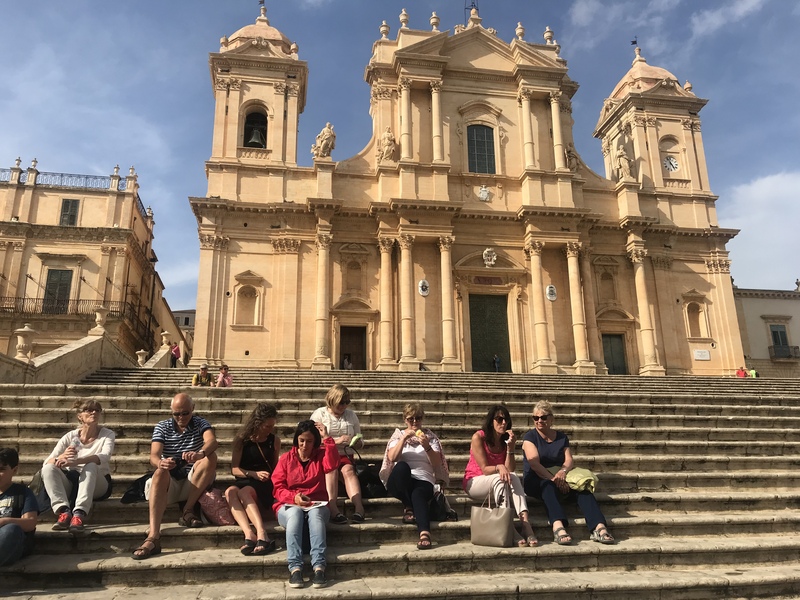 We visited some picturesque towns such as Noto & Ragusa Ibla – beautiful baroque architecture, cathedrals and churches, and stunning views. 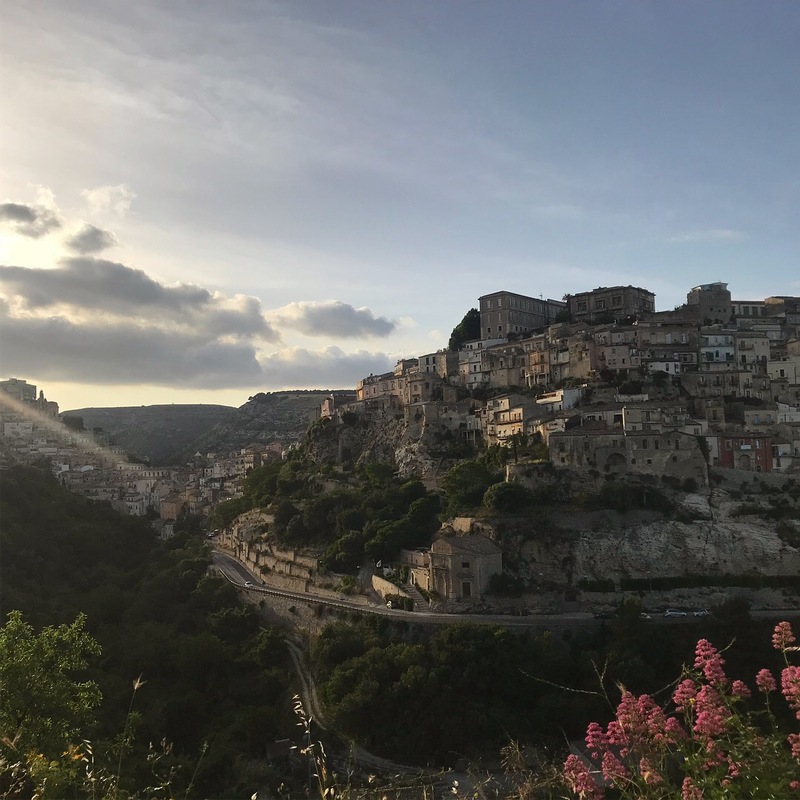 I fell in love with Sicily – a beautiful island with great culture, people and food. I hope to return to see more of the island for more Sicilian food stories. This looks fantastic, what a great experience! Great holiday with fantastic company! Loved it! 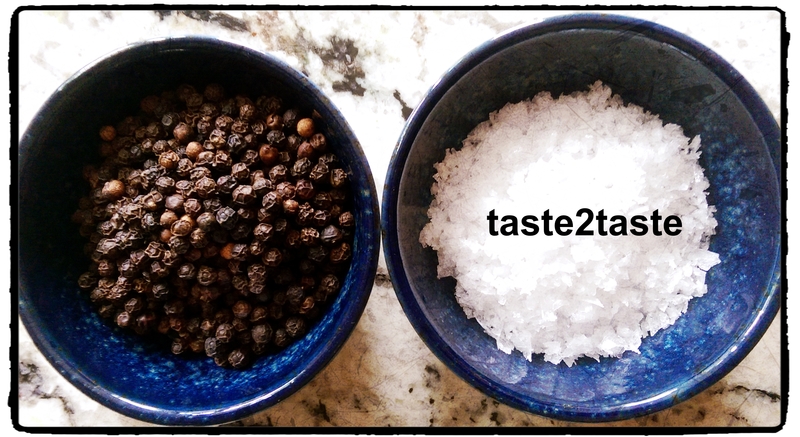 A great foodie holiday – thanks!